What do you do in secret? What do you do when nobody is looking? In your private time when you are alone? Jesus told his followers that our heavenly Father sees what is done in secret and that he will make it known (“For there is nothing hidden that will not be disclosed, and nothing concealed that will not be known or brought out into the open.” Luke 8:17). How does this make you feel? It makes me want to celebrate! I have been reading Matthew 6 for the last week. Jesus is teaching his disciples and the crowd in his famous Sermon on the Mount. He talks a lot about our “secret time” in chapter 6. He is talking about practicing righteousness. He tells the people, “Don’t practice righteousness to be seen by people. Do your acts of righteousness secretly.” What are the acts of righteousness that he is referring to? Giving to the needy, prayer and fasting. There are many ways that we can give to the needy. We can give money. We can give of our time. We can give our talents or skills. Jesus said that when we give of our time, talents and treasure to help those in need, that our right hand should not know what our left hand is doing. What did Jesus mean by this? How can our right hand not know what our left hand is doing? That’s easy. It happens all the time. When we sit down to eat a meal we don’t consciously tell our right hand to pick up the fork and stab a piece of broccoli and put it in our mouth. It happens naturally without much, if any, thought. And after eating the broccoli, we don’t proclaim to those around us what a good deed we have just done (unless we are little children who hate broccoli and want our parents to be proud of us for performing such a disagreeable task). It should be just as natural for disciples of Christ to give money to the down and out, or to volunteer at a homeless shelter, or to change the oil in the car of a struggling single mother. It’s nothing to boast or brag about, unless we have such a childish faith, that we crave the attention of people more than the reward of our heavenly Father. Jesus tells us the Father, the Unseen See-er, sees what we give, and will reward us. Those who boast about what they have given and receive praise from people have gotten their reward. “And when you pray, do not be like the hypocrites, for they love to pray … to be seen by others. Truly I tell you, they have received their reward.” Jesus was talking to the crowd about how to pray and how not to pray. Here he is telling people that when you pray to your Father, pray to HIM! Talk to HIM! Don’t pray to your ego. Don’t pray to impress people. Don’t pray to preach at people. Pray to communicate to God. How is this best accomplished? Jesus continues, “But when you pray, go into your room, close the door and pray to your Father, who is unseen. Then your Father, who sees what is done in secret, will reward you.” If we want to be rewarded by our Father who is in heaven, by answered prayers, intimacy with God, contentment, fulfillment, joy and peace, then we need to do our praying in secret; in silence and solitude. Jesus says you don’t need to make long prayers, to inform God of your needs; to go into great detail about your aches and pains; your work situation; family matters; emotional turmoil; spiritual disappointments; struggles with sin and the like. Jesus says in his introduction to the Lord’s Prayer, that God already knows our needs. He is not in the dark about your situation, just waiting for you to spill your guts so that he will understand what you are going through. When he gives us the Lord’s Prayer as a model prayer, he purposely kept it short. He knows our needs, and simply wants us to acknowledge our needs before him, and depend on him and trust him, believing that he is good and that his love endures forever. Having confidence in him that he loves us and wants us to be happy, and that he will do the right thing. We do all this, if we are obedient to Christ, in SECRET. I don’t fast a lot. It’s not my strongest spiritual practice. I’m somewhat relieved that Jesus didn’t tell us that we need to fast. He just told people, that if they choose to fast, that they shouldn’t make a big deal about it. It is easy to make a big deal about it in our culture. If you want to impress people with your spirituality, tell them that you going without food for a meal, or two or three, in order to get closer to God. That will get their attention. We love our food. We don’t just have three squares a day, but we usually graze in between meals with all manner of snacks. So giving up food for a while,for spiritual growth, is a big deal, worthy of a reward. But where do you want your reward to come from? From the praises and adulation of people who are impressed with your spiritual practice? That can be good for your ego, but what about your soul? God gives you a choice, you can receive your reward for fasting from friends and family, by letting them know what you are doing, or you can receive a reward from the Unseen See-er, our heavenly Father, who wants to bless our socks off with rewards, if we keep fasting our little secret, a little secret between me and God – between you and God. So, do you have a secret? Do you do things in secret that nobody knows about? Things that you prefer to keep under wraps? I hope so. I hope it’s Giving to the needy, Prayer, and Fasting. Sometimes the rewards for doing things in secret are material, physical, or spiritual during our life here on earth. Sometimes the rewards are out of this world! I think that when we get to heaven, God will say, “Well done, good and faithful servant.” And then God will reveal to us, and to the multitudes in heaven, what we did for Him on earth, in secret, and how that made a difference in peoples lives. What a reward that will be! When you think of a ruler, a person of power, who comes to mind? How about when you think of a shepherd? What images come to mind. The thoughts that come to mind when we think of Rulers and Shepherds are normally at both ends of the human spectrum. When we think of Rulers, we think of kings, presidents, dictators and prime ministers. 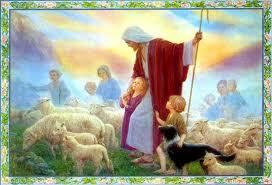 When we consider what a Shepherd is, we think of humility, kindness, gentleness and meekness. Not normally qualities found in most Rulers. Wouldn’t it be great, if a ruler governed like a shepherd, or if a shepherd had the power to rule? I think so, and thankfully, the combination of the two is not just wishful thinking. I have started to read the book of Matthew recently. In chapter two we have the story of the Magi, the Wise Men, traveling to Jerusalem in search of the one “born kind of the Jews.” This gets King Herod’s attention. He doesn’t like the idea of any competition to his vaulted position. He calls together the religious leaders and teachers together and asks them where the Messiah, the Anointed One, the great King, is to be born. They tell King Herod and the Magi, that the scriptures prophesy that the New King is to be born in Bethlehem. The prophet Micah had foretold hundreds of years earlier that out of Bethlehem will come a ruler who will shepherd my people Israel. When I read that, I smiled and thought “Wlhat a great idea. A Ruler who Shepherds.” Then I thought about Bethlehem, otherwise known as the City of David. David was born in Bethlehem. David was a shepherd who became a great ruler. David wrote the 23rd Psalm describing the LORD as a shepherd, who leads His flock to green pastures and still waters. Who protects His flock with His rod, much as David had done when he killed a lion and a bear who tried to harm his sheep. This Shepherd David became the great King David, a man after God’s own heart. Now we hear the good news of a King which is to be born who will rule his people like a shepherd. King Herod had no intentions of ruling his people like a shepherd. Hearing the prophecy of Micah, he was plotting to kill the new born king. He sent the Magi on their way to Bethlehem with the instructions that when they found the baby king, they were to send word to him, so that he too could go and worship the newborn king. The Magi found the child, were overjoyed and worshiped Him. They did not, however, tell King Herod, as they were warned in a dream not to. When the Magi did not report back, the wicked King Herod ordered the slaughter of all boys two years old and younger in Bethlehem. Not much gentleness and kindness in that act. Later on in His life, Jesus lamented the lack of shepherding qualities in the secular and religious leaders of Isreal. In the Gospel of Mark, chapter 6, we read that “when he went ashore he saw a great crowd, and he had compassion on them, because they were like sheep without a shepherd. And he began to teach them many things.” One of the most important things that Jesus taught the people in the Gospel of John is that He is the Good Shepherd. I am the good shepherd. I know my own and my own know me, just as the Father knows me and I know the Father; and I lay down my life for the sheep. And I have other sheep that are not of this fold. I must bring them also, and they will listen to my voice. So there will be one flock, one shepherd. For this reason the Father loves me, because I lay down my life that I may take it up again. Jesus, the King of Kings and Lord of Lords, the ultimate, supreme Ruler, gave His life for His sheep. The Good Shepherd died, so that we might live. Then He rose from the dead, rose to heaven in glory, and now rules His people with the heart of a shepherd, because He loves us and wants us to be happy.